The Crop Base Map command crops the base map (i.e., Google Map, Bing Map, etc.) to the elevation terrain data extents when model is viewed in 3D. The base map will not extend outside of the elevation terrain data limits. 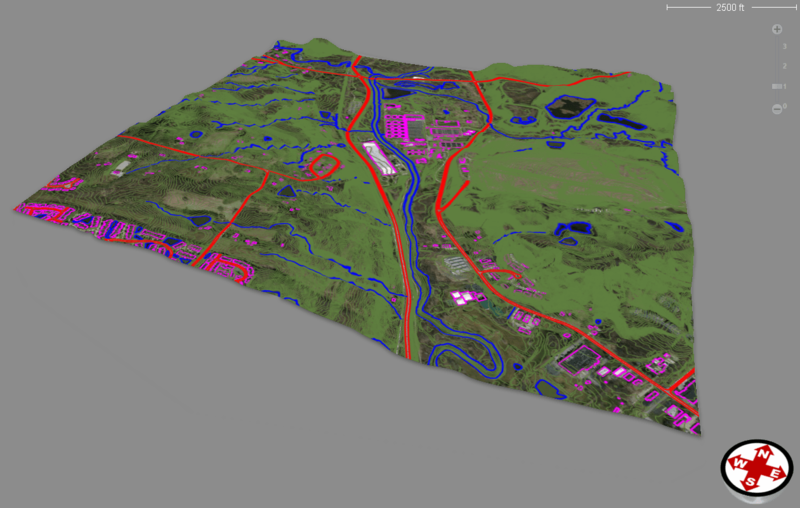 To use the Crop Base Map command, the user must have elevation terrain data loaded in the project. This command only operates in the 3D view mode with terrain data loaded. After loading the elevation data in the project, the user needs to zoom to the elevation terrain data extents on the Map View. Next, switch to 3D view mode on the Map view. Select View from the ribbon menu and then click the Crop Base Map command. The software will then clip the base map to the extents of the elevation terrain data and the project will appear to float in space in the Map View.